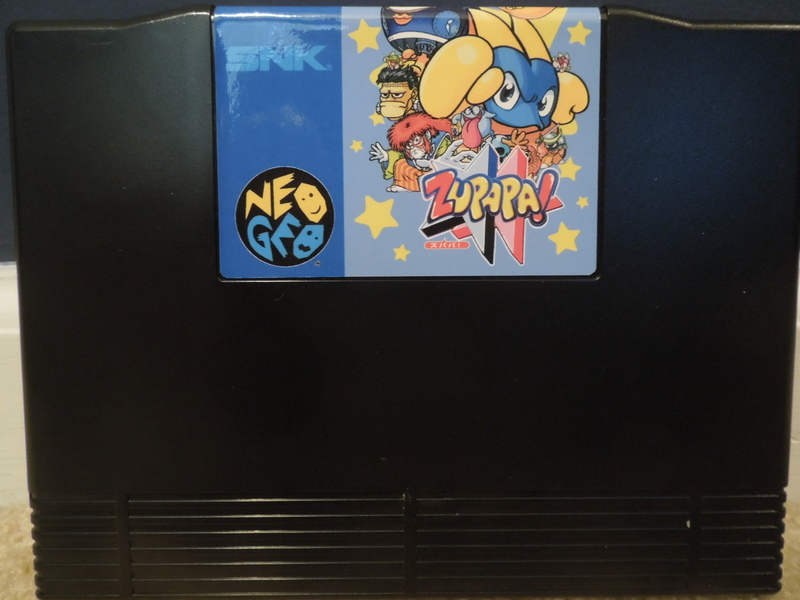 Category Archives: Neo Geo – Zupapa! Zupapa! for the Neo Geo AES. Note 1: Like Neo Geo games? Check out many of my other reviews! Note 3: This review will be quite short, but I’ll try to include as much as I can! Quick History: Zupapa! was released for the Neo Geo MVS (arcade cabinet) in 2001. Evidently, however (from what I’ve been able to find online), the game was actually developed in 1994, but was shelved for 7 years before being released by SNK. 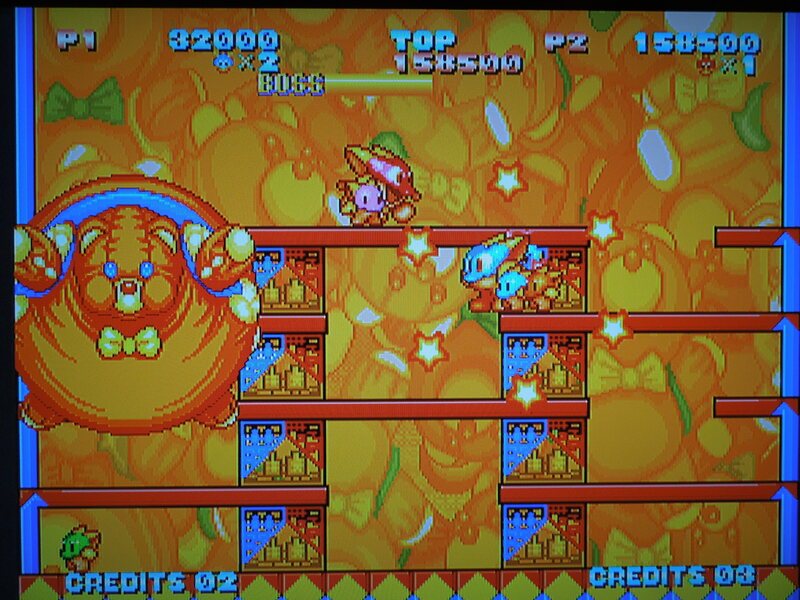 The game never received an official AES release, but conversions of the game, like this one, exist for the home console Neo Geo. This review is for the AES version. An AES conversion of Zupapa! Memory Card Support? Yes. You can save your game by letting the timer run to zero after losing all 3 of your lives. Credits: 4 Credits only on an AES – no unlimited credits here. Lives: 3 lives per credit – 1 hit kills you. 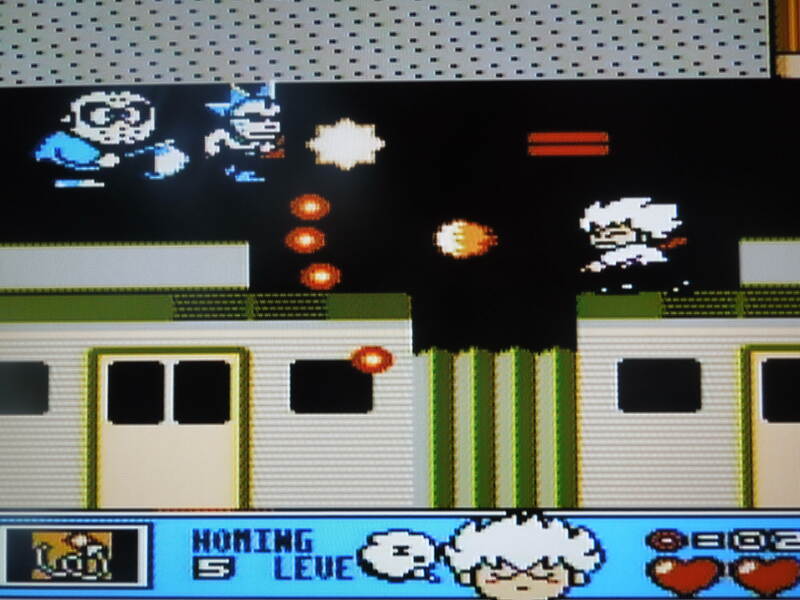 Difficulty Level: The game is defaulted to Level 4 (MVS). The game does not allow you to change the difficulty. The only way to make the game easier or more difficult is to access the UniBios menu, if you have it installed on your AES. Story: Absolutely no story is presented in the game, but based on the ending of the game, I can only surmise that you, a male Zupapa if you’re Player 1 (blue) and a female Zupapa if you’re player 2 (pink), and your Zooks (kids), have to take down a wanna-be Zupapa and all of his minions across 9 worlds. Doing so will allow you and your kids to live happily ever after on your own Zupapa planet. Oh, a Zupapa looks kind of like a platypus wearing a mask and boxing gloves. Worlds: There are 9 Worlds for you to complete, each comprised of 5 levels. You can choose the first World you start on, and after that the game moves in a clockwise circle through the next 5 Worlds. After completing those, the final 3 Worlds become available to you. There are no names for each World, but each has it’s own theme, enemies, and boss (in the final level of each World) and here’s what I would call them: Horror World, Toybox World, Prehistoric World, Circus World, Ancient Japan World, Animal World, Space World, Medieval World, and Devil World. There are 9 unique Worlds to conquer in Zupapa! (3 others appear after the first 6). Gameplay: In Zupapa!, each level is comprised of a single screen that you must ‘clear’ of all enemies before you can advance to the next one. There is a time limit (not viewable, but notable by a ringing alarm clock creature and then a demon killing you if you don’t heed the clock), but most levels you’ll clear of enemies quickly. Your Zupapa character can punch enemies with button A, making them vulnerable to be killed by simply touching them. Additionally, you can collect your randomly scattered Zooks from around the screen and hurl them at the enemies, which likewise incapacitates them for a kill. The key to clearing a level quickly, however, is gathering as many Zooks as possible (4 total) and hurling them ALL at an enemy. If you touch an enemy with Zooks holding it down, a circle of stars will envelope a portion of the screen, killing any enemies it touches! The size and reach of the circle of stars is dependent on how many Zooks you threw at the enemy. So basically, hurling all 4 onto an enemy = the most additional kills by your circle of stars. 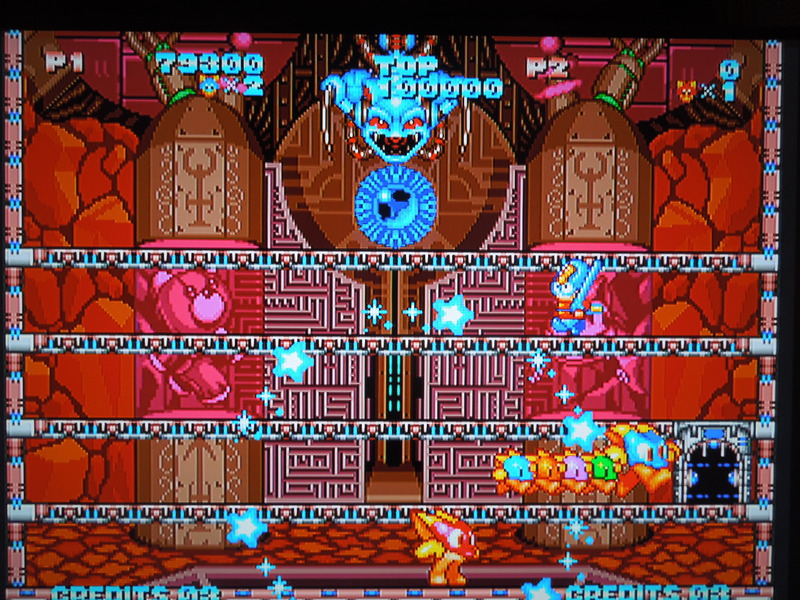 Bosses cannot be punched, but instead require you to either hurl Zooks at them repeatedly (slower method) or use the circle of stars method (faster method). Use the ‘circle of stars’ killing method to rack up big points! Items: During levels, a “P” or an “S” icon will randomly be dropped into the screen. The “P” increases the power and range of your regular punch, and it allows your to throw any of your gathered Zooks at an enemy in a single throw, instead of one at a time (time saver). The “S” icon is a speed-up icon, allowing you to move almost twice as fast as normal. You can also gather random icons that allow you to add to your high score by simply jumping or punching! Other items include fruit icons that add to your high score as well. High Score: Zupapa! is an addictive ‘high score’ game. You’ll get a ton of fruit (points) for killing bosses, but you can also get additional fruit by using the circle of stars method of killing enemies. Different fruit offer different values. For example, the cherry gives you 2,000 points. The orange gives you 3,000. 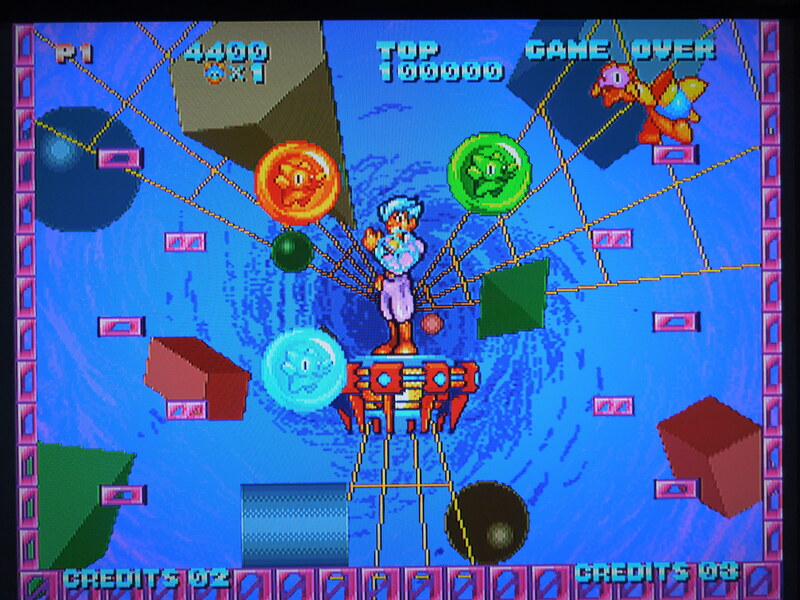 If you kill 2 enemies with your circle of stars, you’re guaranteed to get a cherry and an orange. If you hit 3 enemies, you’ll get a cherry, an orange, and whatever the next highest fruit is (grape for 4,000 points, I think). I enjoy playing and keeping up with my high score based on only 1 credit. I’m currently at around 700,000 points while getting through 2 Worlds before I get taken out. Each World has it’s own unique ‘theme,’ like the Toybox World with a giant teddy bear as the boss. Player 2 AES bug? When playing the game in co-op, there was a problem. I’m not sure if it’s just my copy of the game, or if this would happen anytime Zupapa! was converted or played in AES mode. If I was playing a 1-player game, and a second player wanted to join in (using controller 2, port 2), they couldn’t. Their side of the screen (top right) alternates between ‘Game Over’ and ‘Push Start,’ but pushing Start does not allow them to join (nor does Select, in case you were wondering). So I reset the game, and used controller 2 (in port 2) to Start the game – no problem there, and everything worked just fine. However, after losing all 3 lives, and the ‘Continue?’ message and countdown appearing, I could not continue no matter what I pressed even though I still had Credits left! This is not a problem playing a 1-player game, as continuing is as easy as pressing Start (as long as you have the Credits for a continue). 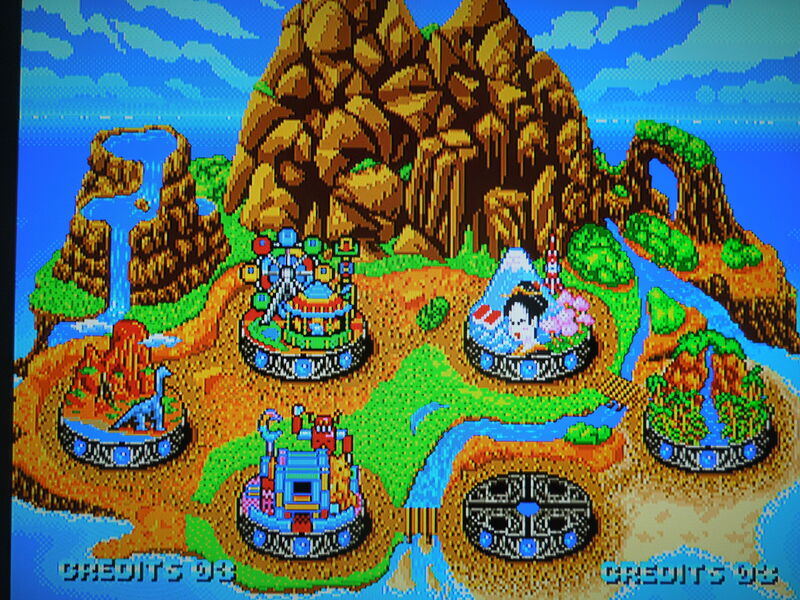 Using my UniBios menu, I switched the game to MVS (arcade mode), and the problem did not exist – I could enter Credits with Select and press Start to continue with both Player 1 and Player 2. So, I can only gather that this is an AES programming bug. Comparison to Nightmare in the Dark: If you read my review of that game, you’ll notice the two games are structurally similar. There is actually a great comparison review on a website I found called neogeokult.com that is far better than what I’m typing here. Personally, I still prefer Nightmare, but it’s close. Zupapa! does contain more levels than the former, and it has the added bonus of being able to choose where you start, which is quite nice. Zupapa! also plays faster than Nightmare, with less time being given to complete each stage. Zupapa! is definitely more difficult than Nightmare, if only because of it’s length. 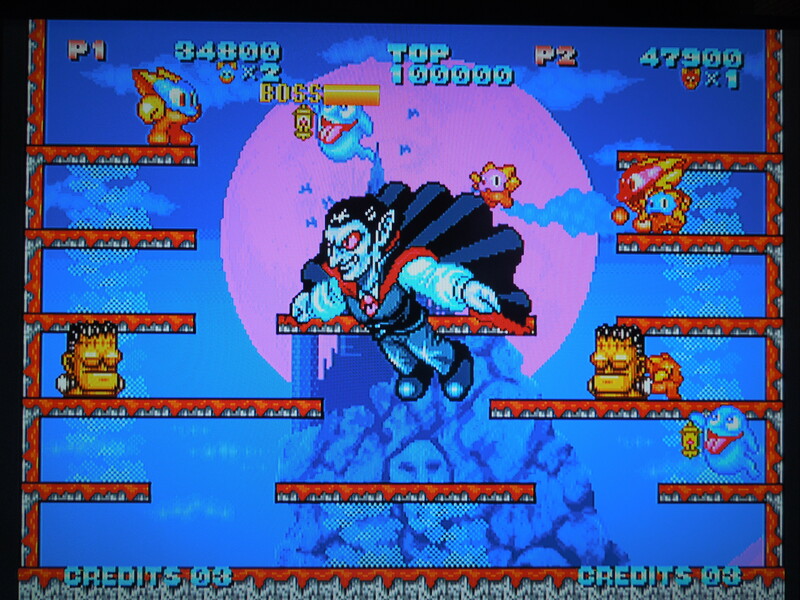 It doesn’t take too much time to beat Nightmare on the 4 given Credits, but it would take much longer to master Zupapa! with only 4. The final boss is not what he appears to be – and he has diabolical plans for the Zupapa!